This article supplements a webinar series on deploying and managing containerized workloads in the cloud. The series covers the essentials of containers, including managing container lifecycles, deploying multi-container applications, scaling workloads, and working with Kubernetes. It also highlights best practices for running stateful applications. This tutorial includes the concepts and commands in the third session of the series, Getting Started with Kubernetes. In the previous tutorial in this series, we explored managing multi-container applications with Docker Compose. While the Docker Command Line Interface (CLI) and Docker Compose can deploy and scale containers running on a single machine, Kubernetes is designed to handle multi-container applications deployed across multiple machines or hosts. Kubernetes is an open-source container orchestration tool for managing containerized applications. 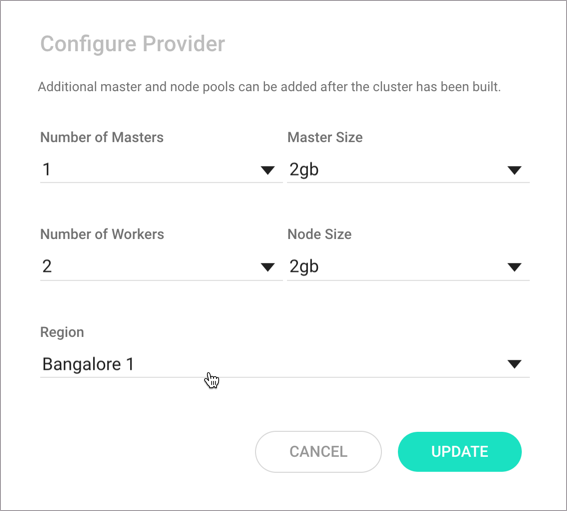 A Kubernetes cluster has two key components: Master Nodes and Worker Nodes. A set of Master Nodes act as the control plane that manage the Worker Nodes and deployed applications. The Worker Nodes are the workhorses of a Kubernetes cluster that are responsible for running the containerized applications. The Master Nodes expose an API through which the command-line tools and rich clients submit a job, which contains the definition of an application. Each application consists of one or more containers, the storage definitions and the internal and external ports through which they are exposed. The control plane running on Master Nodes schedules the containers in one of the Worker Nodes. When an application is scaled, the control plane launches additional containers on any of the available Worker Nodes. For a detailed introduction to Kubernetes, refer to the tutorial An Introduction to Kubernetes. StackPointCloud deploys a Kubernetes cluster in three steps using a web-based interface. It hides the complexity of installing and configuring Kubernetes through a simplified user experience. 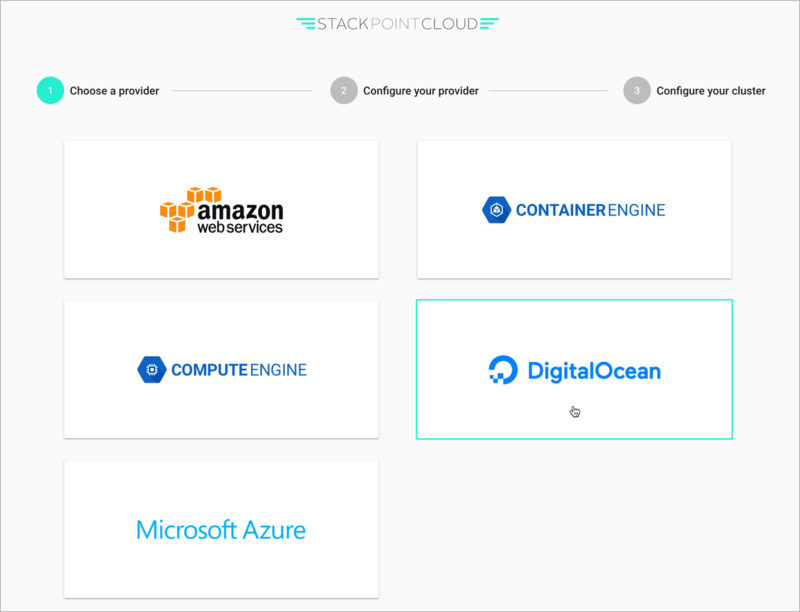 DigitalOcean is one of StackPoint’s supported cloud platforms. Developers who are not familiar with systems administration and configuration can use StackPoint to install Kubernetes on DigitalOcean quickly. For details on the supported features and pricing, refer to their site. In this tutorial, you'll set up and configure Kubernetes on DigitalOcean through StackPoint and deploy a containerized application to your cluster. A local machine with the curl command installed, which you'll use to download a command-line tool to manage your Kubernetes cluster. The curl command is already installed on macOS and Ubuntu 16.04. A DigitalOcean account. 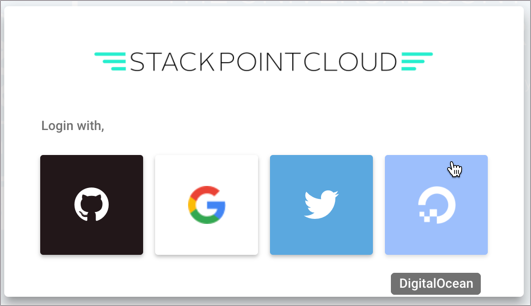 In this tutorial, you'll use StackPoint to connect to your DigitalOcean account and provision three 1GB Droplets. To start the installation of Kubernetes on DigitalOcean, visit Stackpoint.io and click on the Login button. This takes you to a page where you can choose an identity provider and log in with existing credentials. Choose DigitalOcean from the list and log in with your DigitalOcean username and password. On the next page, choose DigitalOcean from the list of available cloud platforms. This takes you to the Configure Provider screen. Choose a region of your choice from the Region dropdown list. You can leave the other settings at their default values. Click on Submit when you are done. On the next screen, enter a cluster name of your choice and click Submit. The cluster installation will now start and you’ll be taken to a page where you can track the cluster’s progress. The installation will take about 15 minutes. Once the cluster is configured, we can set up a command-line tool to work with it. To talk to the Kubernetes cluster running in DigitalOcean, we need a command line tool in our development machine. We'll use kubectl, the CLI for Kubernetes. With kubectl configured, let’s make sure we can communicate with our cluster. Now that we have the fully configured cluster along with the client, let’s run a few commands to verify the environment. Run the following command to get information about the cluster. The output confirms that the cluster is working and that the Kubernetes Master Nodes are up and running. Next, let’s verify the health of all the components running in the Master Nodes. If the cluster is just configured, it may take a while before all the components show a healthy status. These components are a part of the Kubernetes Master Nodes that act as the control plane. Finally, let’s list all the nodes of the running Kubernetes cluster. This confirms that the cluster with one Master Node and two Worker Nodes is ready for us to deploy applications. So let's deploy an application to the cluster. This command is similar to the docker run command, except that it packages and deploys the container in a Kubernetes-specific artifact called a Pod. You’ll learn more about Pods in the next part of this series. The Pod is now exposed on every Node of the cluster on an arbitrary port. The --port and --target-port switches indicate the ports through which the web server becomes available. The switch --NodePortensures that we can use any Node on the cluster to access the application. To get the NodePort of the myweb deployment, run the following command. In this case, the NodePort is port 31930. Every Worker Node uses this port to respond to HTTP requests. Let’s test it out. Use the DigitalOcean Console to get the IP address of one of the Worker Nodes. Use the curl command to make an HTTP request to one of the nodes on port 31930. You have successfully deployed a containerized application to your Kubernetes cluster. Kubernetes is a popular container management platform. 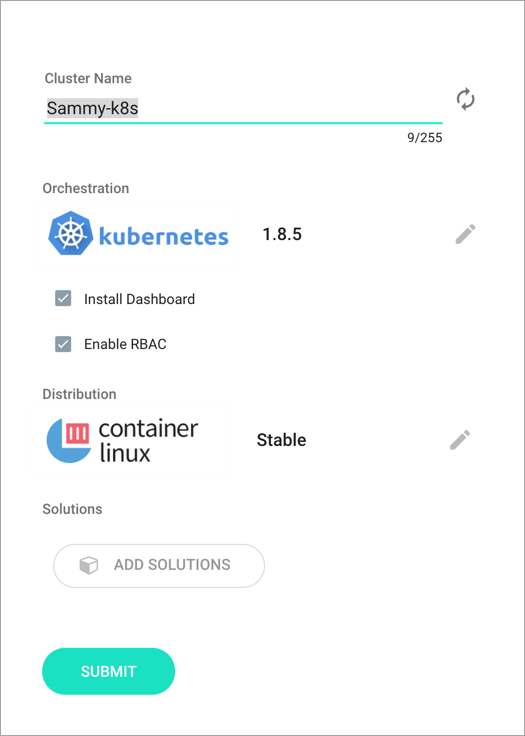 StackPoint makes it easy to install Kubernetes on DigitalOcean. In the next part of this series, we will explore the building blocks of Kubernetes in more detail. This series covers the essentials of containers, including container lifecycle management, deploying multi-container applications, scaling workloads, and understanding Kubernetes, along with highlighting best practices for running stateful applications. These tutorials supplement the by the same name. This article supplements the first session, Getting Started with Containers, in a six-part webinar series on Deploying & Managing Containerized Workloads in the Cloud. By the end of this tutorial, you will have installed Docker on a DigitalOcean Droplet, managed containers, worked with images, added persistence, and set up a private registry. In this tutorial, you will use a sample web application based on Node.js and MongoDB to build a Docker image from a Dockerfile, you will create a custom network that allows your Docker containers to communicate, and you will use Docker Compose to launch and scale a containerized application. In this tutorial, you will learn how Kubernetes primitives work together as you deploy a Pod in Kubernetes, expose it a Service, and scale it through a Replication Controller. 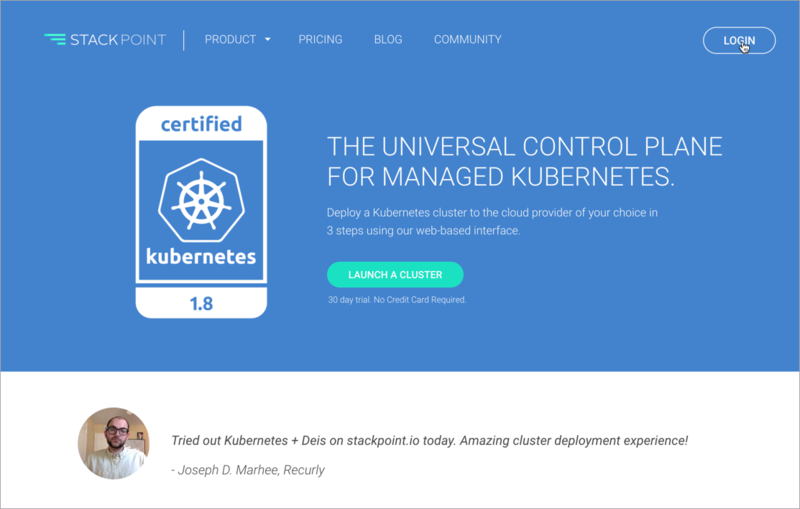 In this tutorial, you will apply the concepts from the previous tutorials to build, deploy, and manage an end-to-end microservices application in Kubernetes. The sample web application you'll use in this tutorial is a "todo list" application written in Node.js that uses MongoDB as a database. You'll build a container image for this app from a Dockerfile, and push the image to Docker Hub, and then deploy it to your cluster. Then you'll scale the app to meet increased demand. In the final installment of this tutorial series, you will deploy a highly available MongoDB ReplicaSet in Kubernetes as a StatefulSet using Helm, a popular open source package manager for Kubernetes.